Need to keep track of thousands of assets? High product density and heavy traffic across a large area? Get the capacity and range you demand for reliable RFID tag reading with the AN440 high-performance RFID area antenna. A good-looking, rugged general-purpose area antenna, the AN440 is designed to perform exceptionally in all environments, indoors and out. The AN440 RFID Antenna gives you a wide read field and high-speed RF signal conversion, so data capture is fast and accurate, even in expansive, high-demand environments. The AN440 is easy to mount on ceilings and walls, and its rugged white housing is at home in both customer-facing and industrial settings. So you can achieve superior read zones around stockroom shelves, warehouse doorways and dock platforms "" anywhere boxes and pallets are moving into and out of your facility. 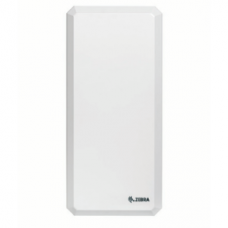 Zebra AN440 RFID Antenna, UHF, Outdoor or Indoor, High Performance, Dual Antenna.